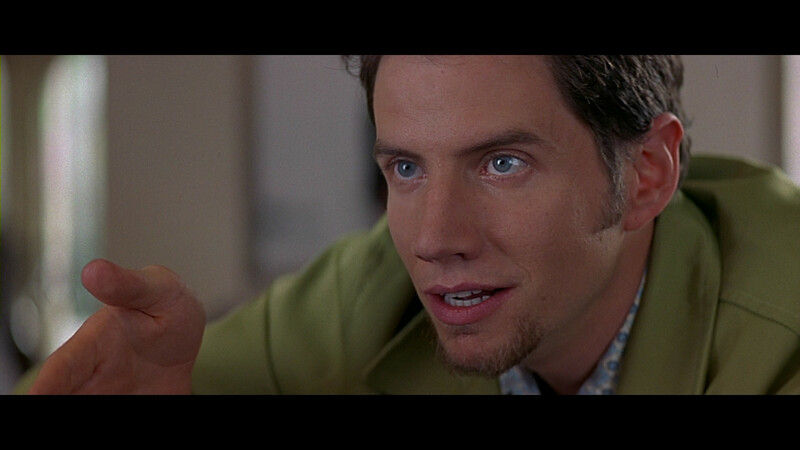 NOTE: For some reason these images have gotten downsized on Photobucket so please visit the Scream 2 page for the actual screen capture as I had done. Thank you. 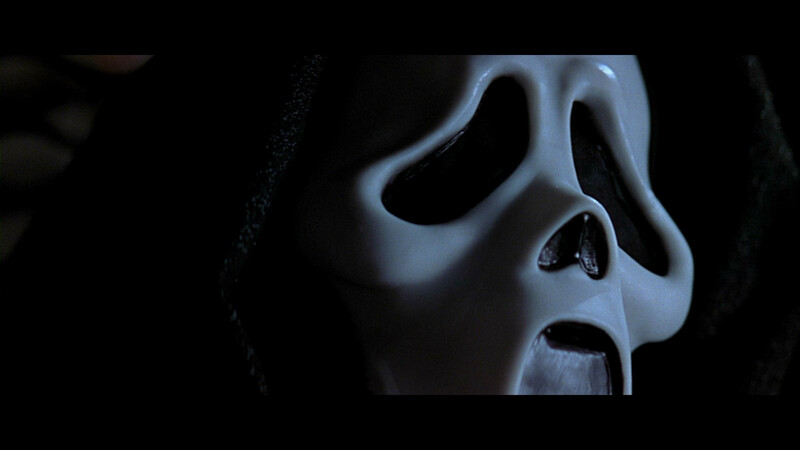 With the original Scream hauling in a hefty amount, not a year later the sequel was released. As with most sequels, Scream 2 mainly rehashes what happened in the original but gives it a slight twist that isn’t quite as clever yet at the same time is still one hell of an entertaining film. The movie begins much like the original with not one but two cameos by Omar Epps and Jada Pinkett, our new Ghost Face killer’s first kills. The two are a couple attending the wild opening night of “Stab”, a movie based upon the events that occurred in Woodsboro the year before and based upon the book by Gail Weathers. After a fun movie-within-a-movie sequence starring Heather Graham, Ghost Face strikes with a vengeance kicking off a “real life” sequel within a sequel. We then go and are reintroduced to Sidney Prescott (NEVE CAMPBELL) attending college and trying to put the events from the year before behind her. When the killings from the night prior are reported, her world begins to fall apart piece by piece once again as she confides in Randy (JAMIE KENNEDY) who is in denial that the murders has anything to do with them. Not before long, the press has swarmed the college town including Gale Weathers (COURTNEY COX) sporting a new look and with the recently released Cotton Weary (LIEV SCHREIBER) in tow in the hopes to score an exclusive reunion interview which Sidney wants no part of. And wanting no part of Gale is obviously ex-boyfriend Dewey Riley (DAVID ARQUETTE) who is obviously still attracted to Gale but disgusted by her cavalier attitude in covering the story. And obviously the sequel would not be complete if Sidney didn’t have a boyfriend for the viewer to be wary of. His name is Derek (JERRY O’CONNELL), a frat brother who looks suspicious 90% of the time and lost/dumbfounded the other 10%. He’s on the list of suspects with others especially those originally from Woodsboro including Cotton. I remember going to see Scream 2 at the theater back in ‘97 and came out loving every second of it and in fact rating it much higher than the original. Now 13.4 years later and several viewings at home later including this latest, it doesn’t hold up quite as well especially if you watch it within a day after the first one. Now, the killings are pretty standard but the Scream series have rarely been about the actual killing – most often it’s Ghost Face coming from behind and stabbing the victim in the chest before finishing him or her off – but the who’s next and ultimately the reveal of who the killer is at the end which the series is known for. Casting wise, it’s all fairly similar to the first. Yeah, you have the originals between Campbell, Kennedy, Arquette and Cox – who all slip back into their parts just fine – but the additions of Liev Schreiber, Timothy Olymphant, Elise Neal and Sarah Michelle Gellar (for as large a part as it was) were decent replacements for who was lost after the slaughters in Scream. I’ve always been a big fan of Liev Schreiber which during this period was his breakout in film between Random in ’96, Scream 2 in ’97 and Phantoms, Sphere (bad film, great cast) and Twilight (no not the vampire soap opera) in ’98. He’s a stellar actor who’s only gotten better over time but he brings intensity to the role of Cotton Weary that Scream 2 needed. Also back in the fold is director Wes Craven and writer Kevin Williamson still cashing in on his surprise success which included selling off I Know What You Did Last Summer (co-starring Gellar) to Sony, a film that nearly epitomizes what the Scream movies mocked about the horror genre. 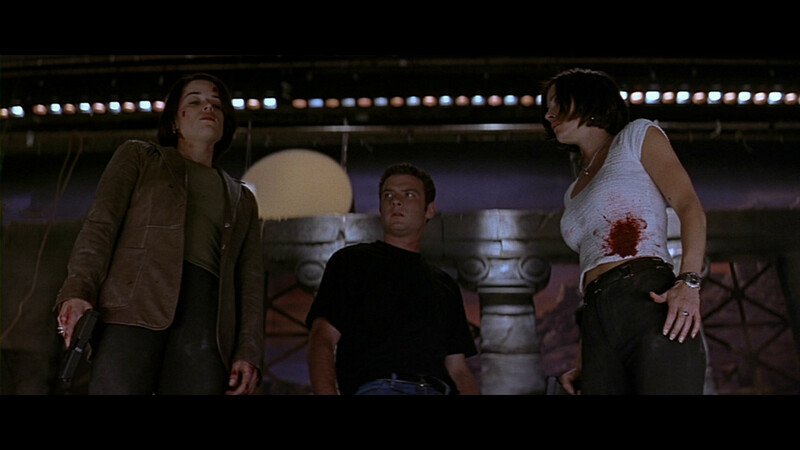 It’s obvious that the influence of Williamson has had on these movies compared with Scream 3 where Dimension decided to go with Ehren Kruger after an apparent dispute with the studio (more on that with my upcoming review). Scream 2 doesn’t quite measure up to my initial memories of my first viewing nor is it as good as the original especially when essentially watching them back to back, but as far as sequels to horror movies go, and to horror movies that poke fun at the genre, it’s not bad at all supplying some good suspense and a decent twist at the end. All of the features, save for the useless “Cast & Crew Bios”, have been ported over and are presented in standard definition. First up is the audio commentary with Director Wes Craven, Producer Marianne Maddalena and Editor Patrick Lussier which is pretty good providing behind-the-scenes information on how the project came together, story elements, etc; two terrible looking deleted scenes (4:09) with optional commentary by Craven and the gang; a selection of outtakes (8:54); an EPK featurette (7:05) so mundane that it’s only called “featurette”; two music videos from Master P and Rottonmouth; the theatrical trailer (2:16) and TV Spots. There is a preview for the upcoming Scream 4 release and advertising for the Saw Blu-ray releases. The transfer for Scream 2 seems to suffer the same ailments as the first installment meaning while one scene may look a tad drab, the very next looks oversaturated which I think is more a stylistic choice by the director than the actual transfer. This one doesn’t quite have the blotchy look by comparison though it gets close here and there. But all in all it’s a fine transfer and a modest upgrade over the DVD version. Similarly, the 5.1 DTS-HD Master Audio track is pretty good once again showing off the numerous screams both for those dying and those who find the dead. Dialogue is crystal clear and easy to comprehend and Marco Beltrami’s score comes across quite well. Rear channels don’t get used a whole lot but I did notice ambient noises like birds chirping or general chatter from extras. 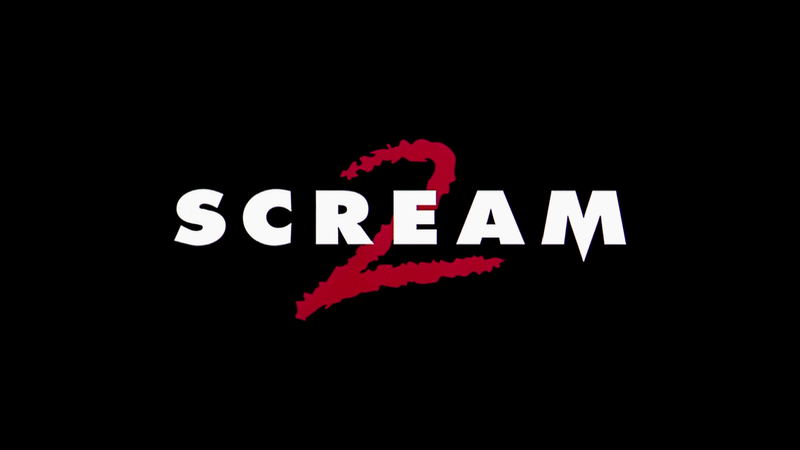 Overall, as far as sequels go – and with horror sequels specifically –, Scream 2 is a success. Yes, it utilizes much of the same formula as the original transplanting high school for college and adding some depth to those who went through those events, but the suspense aspects more so than horror or cranked up a notch. The Blu-ray itself has a good, albeit uneven, video transfer and a well rounded audio track that makes this a worthwhile upgrade. Check out some more screen caps by going to page 2. Consider them to be major spoilers, however.